Since my temporary office window looks over a golf course green, I get to watch as the grounds crew keeps the course golfer friendly. Early every morning, the grounds crew comes to the green. They move the pin/flag; they repair the sand traps; they cut the grass; they add fertilizer; and then depart before the first golfers arrive. Right now, these nine holes are closed for two weeks so the crew can do more extensive work to prepare for the summer. Greens, tees collars and approaches are aerified. Fairways are aerified with the aerway machine. Greens, tees, fairways, collars and approaches have been double verticut. 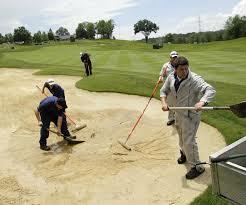 Bunkers (sand traps) are restored. There have been 8 to 10 people working on #6 fairway and greens today. Doing all the above invisible tasks that produce an outstanding golf course. The average golfer; however, comes to the course, registers, hits some practice balls and then starts golfing. They expect the course to be in excellent shape and usually “fuss” if there is a piece of grass out of the place. Some complain louder than others. All this reminds me of our work in associations: conferences, membership, publications, etc. All consume hundreds of hours from our staff. Updating member records. Producing a great magazine or website. Building an outstanding conference program with quality speakers. And, like the golf grounds crew, most of these tasks are invisible. The members just expect them to be done because they expect a perfect experience. And, one inaccurate address or misspelled name, one typo in a newsletter, one poor speaker, etc. lead to member complaints. It may not be fair. But, that’s the way it is. Success is EVERYTHING done right. FAILURE is just one little thing done wrong. In the association world (as in the rest of society), good enough is not enough. Good really is the enemy of great!